Every Friday, I post a Friday Favorite. These are my most popular past posts. I share them because I like them, you like them, and perhaps you haven’t had the time to read all my past posts. Enjoy and feel free to comment! I think I started to get semi-serious about writing right around the time that I started to get semi-serious about girls. If you’ve ever gotten semi-serious about girls, you know it’s a complicated matter. It motivates you to do things like dress better, play sports, and pretend that you have to shave. The problem with getting semi-serious about girls, though, is that you very rarely finish anything. You write a little bit, then cry a little bit, write a little bit more, talk to a girl, cry some more, write, sleep, dream about girls, pretend to shave…. and nothing ever gets done. And it’s just a hassle. I tell you all of this because what I really want to say is that I started to get semi-serious about writing because I wanted people to like me. I thought if I wrote my moody pre-teenage feelings poetically enough on my Xanga people would say “Ooh, he’s moody and poetic” and then they would immediately associate me with other moody and poetic people like Johnny Depp and John Mayer. 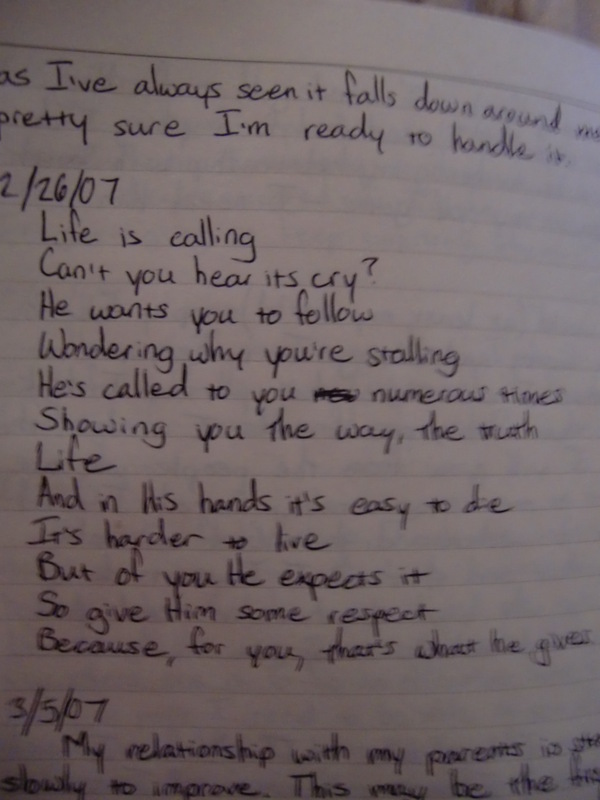 Some moody and poetic teenage writing. Over the years, writing and I have had a bit of a rocky relationship. He helped me get a girlfriend in high school. And then I didn’t talk to him for a while. But then he selflessly got me into college, and I started hanging out with him again. Then he made me into a hipster, and I couldn’t forgive him for a while. The thing is, though, that I’ve never really been fair to writing. I’ve been using him for ulterior motives even before I knew what that word meant. One night, when writing and I were on the outs, I went on a run because I was feeling kind of alone, and when you are feeling alone and you and writing are on the outs, there isn’t much else to do but to run. And while I was running, I was kind of talking to God because God is easy to talk to when there aren’t people around and the night is dark and you are in a golf course. While I was running and being with God, I realized that writing should be a little bit like talking to God. When you talk to God, it’s kind of hard to be selfish. Being selfish with God is a bit like meeting the president and asking him why they served cold food at your school that morning. It’s just not something you do. Instead, when you are talking to God, you start to realize all of the things you care about and all the people you care about. That’s a really beautiful thing, and it dawned on me that night while running and talking to God, that writing should be beautiful in that way. So I’m making a commitment. Writing should be like talking to God. The title of this site is “Spencer Writes,” but it’s only that because it’s cute and catchy. What I really want it to say is “Spencer Writes About People He Loves” because there really isn’t anything else worth writing about. This entry was posted in Friday Favorite and tagged Christianity, faith, friday favorite, God, life, poetry, religion, teenager, writing. Bookmark the permalink. Very nice post Spencer! I totally know what you mean. Writing is often a solitary project, but it doesn’t have to be. Especially when you have God in your life. I’ve been trying to figure out who in the world my muse was, and last night it dawned on me. My muse is the Holy Spirit. I was filling in for the nuns at our church center last night because they were away, and I brought my laptop with me. I find that I always tend to get inspired whenever I am in church, or on church grounds. Thanks for sharing! The Holy Spirit as muse is a great concept! You spoke to me through this. I’ve been using my writing as a false idol, and even when I write about God I enjoy writing more than the evangelization. I have been trying to figure out how to tie faith with writing. And this is it: Writing should be like talking to God. I’m glad I could be encouragement! Thanks for reading, and happy writing! Reblogged this on A Catholic Sheep. I think this is probably your best entry. The greatest writers know how to end their works with stunning paragraphs that leave you reeling. One Hundred Years of Solitude and A Farewell to Arms do this; I am not equivocating you to them, but you ended this post wonderfully. Trent, you are an excellent human being. Thanks.